Johnny Dumfries heralds from one of Britain's most aristocratic families - his real name is John Colum Crichton-Stuart, 7th Marquess of Bute and he is the Earl of Dumfries. As such he is the heir to a vast fortune, as well as being a distant cousin to Queen Elizabeth. Educated at Ampleforth College, he ditched his public school education to pursue his hobby of motor racing. After spells as a painter, decorator and driver of the Williams' team bus, his perseverance paid off and he began to get some drives in karting in 1980. From there he graduated to Formula Three, winning the British Championship in 1984, which gained him a season test driving for Ferrari while struggling in Formula 3000. There were raised eyebrows when he was signed by Renault Lotus in 1986 - Derek Warwick had been expected to gain the No. 2 seat alongside Ayrton Senna, but it was Senna who persuaded the team to go for the relatively unknown Dumfries, as he did not feel they could run two competitive cars. Dumfries raced for them the entire season with two points-scoring finishes from 16 starts, his best was a fifth place in Hungry. He lost his drive in 1987 when Lotus did an engine deal with Honda, which was conditional on them signing Satoru Nakajima. Dumfries continued to race, winning the Le Mans 24 Hour in 1988. 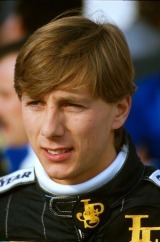 He retired from racing in 1991 because of the illness of his father, and took over the family estate in 1993. An unassuming and unpretentious individual, he has few airs or graces and prefers to be called John Bute. "I was always uncomfortable with inherited wealth. I have always had a strong work ethic and felt I had not earned it," he told the Independent in 1999. "I desired above all else to excel at something through my own efforts. I suppose by going into motor racing, I put myself in a similar situation to that into which I was born - a small minority of single-seat drivers - but at least it was all my own energy that got me there."